The Tobago is a beautiful and romantic classic sailboat. It is a boat from before, when they were made to last more than one life. 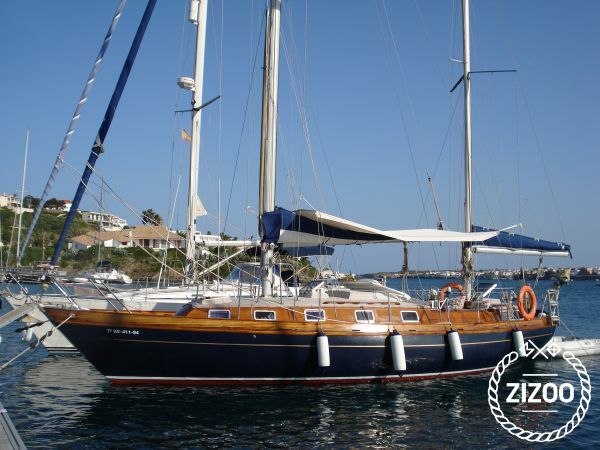 It is 12m long and weighs 16 tons which makes it safe and comfortable sailing, as well as being light and easy to sail. It has the necessary equipment for navigation and security. It's been my boat for 25 years and in several months of each year it has also been my home. Since last year I charter with him. It is moored in San Antonio, west coast of Ibiza. It is the most unspoiled and most charming coast of the island, where it is easy to find solitary anchorages with crystal clear waters, Es Vedrá, Atlantis, Isla Conejera, the Margalida islets, be it Balandres, Cala Aubarca and the north coast of Ibiza which in my opinion It is the most beautiful of the Baslears. To spend a day or several days in the sea is an unforgettable experience, sailing, snorkeling, eating, visiting and enjoying places where you can only access by boat ... it is something that lingers in the memory. It is a way to get to know another Ibiza seen from the sea and its coves. As Albert Camus said "the days of the sea are all similar, like those of happiness" Price of the pattern NOT included in the final price.